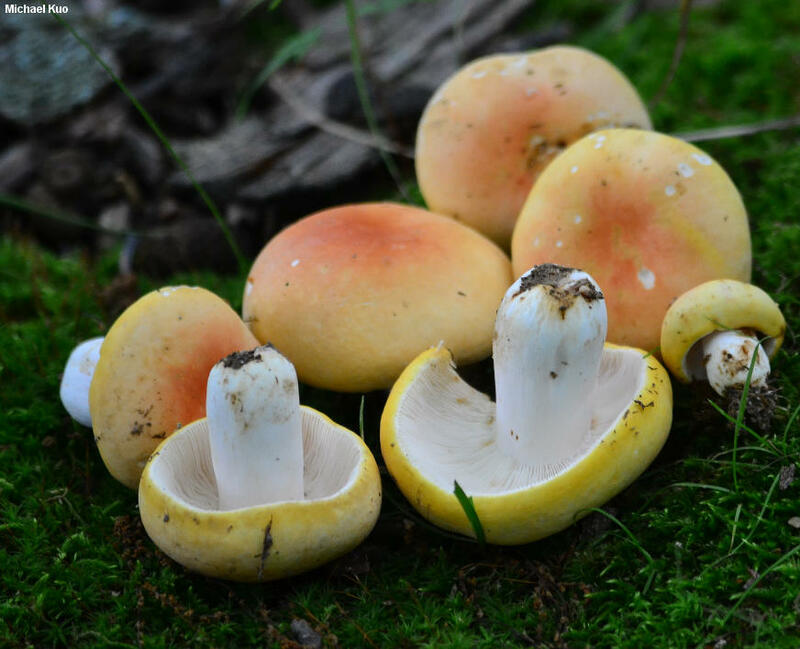 This beautiful yellow Russula was originally described by Charles Kauffman (1918) on the basis of collections made under oaks and maples in Michigan. The range of the species has since been expanded to include oak and beech forests throughout most of eastern North America. Russula ochroleucoides is a firm and hard species with non-peeling cap skin, gills that are often forked near the stem, and surfaces that bruise and discolor brown. The cap color is fairly variable, ranging from a gorgeous pinkish orange (when very fresh and young) to, more commonly, dull medium yellow or even yellowish buff. 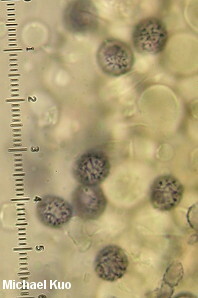 Other distinctive features include the oily, bitterish taste, the slowly pink reaction of the stem surface to iron salts, and microscopic features (see below). Not a lot separates Russula ochroleucoides from Russula flavisiccans, other than cap color (the latter species is pinkish red); the two species may be very closely related. Ecology: Mycorrhizal with white oak and with beech; growing alone, scattered, or gregariously; summer and fall; widely distributed in eastern North America. The illustrated and described collections were made in Illinois. Cap: 4-10 cm; convex, becoming broadly convex to flat, or shallowly depressed; firm and hard, at least when young and fresh; dry; bald or very finely velvety; with maturity often developing a network of cracks and fissures, especially over the center; when young and very fresh bright yellow marginally and pinkish orange centrally--but usually bright yellow to pale or very pale yellow when collected, with pink hints sometimes persisting over the cracked center; the margin not lined; the skin quite adnate and not peeling away easily. 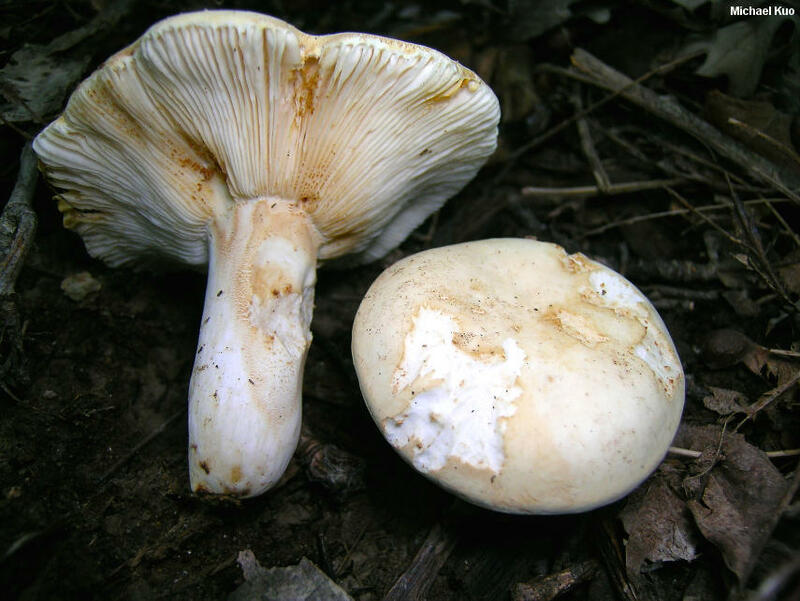 Gills: Broadly attached to the stem; close or nearly crowded; often forked near the stem; short-gills infrequent; white, becoming creamy with age; usually bruising yellowish, then slowly brown to reddish brown; usually developing brownish spots and discolorations with age. 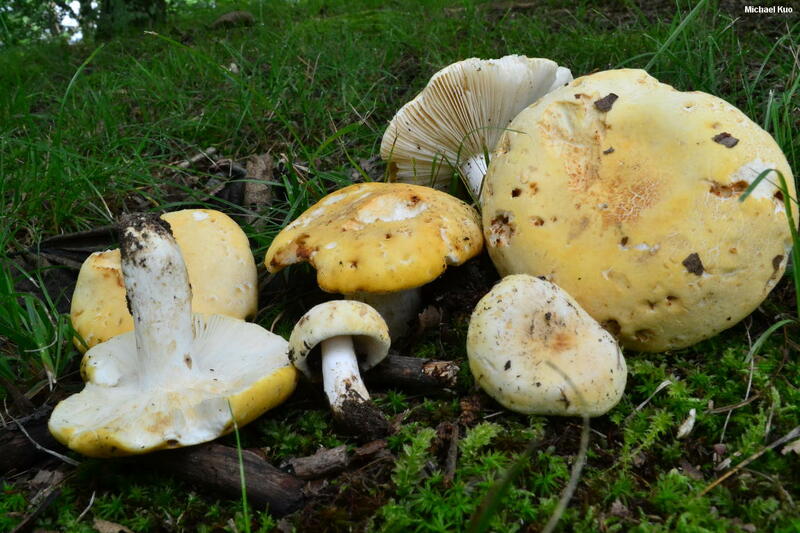 Stem: 2-6 cm long; 1-2 cm thick; more or less equal; bald; whitish; bruising and discoloring yellowish, then slowly brown. Flesh: White; unchanging when sliced; quite firm when fresh. Odor and Taste: Odor not distinctive, or faintly fragrant; taste usually oily and somewhat bitter or acrid, but occasionally not distinctive in older specimens. 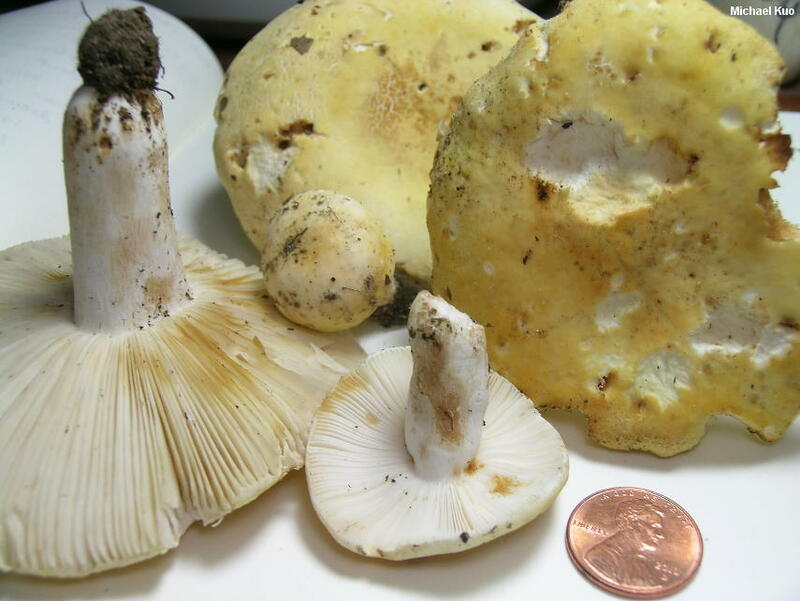 Dried Specimens: The gills dry brownish yellow, as in Russula flavisiccans. Chemical Reactions: KOH on cap surface negative to orangish. Iron salts slowly pink (wait 10-15 minutes) on stem surface. Spore Print: White or creamy. Microscopic Features: Spores 6-8 x 5-7 µ; subglobose or broadly ellipsoid; with amyloid warts that project less than 0.5 µ, and connectors forming partially reticulate areas. 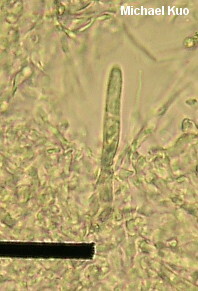 Pleurocystidia 60-90 x 7-10 µ; subfusiform. 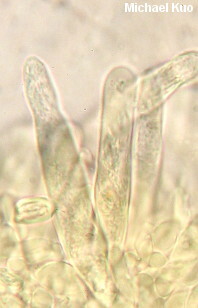 Pileipellis a cutis underneath a turf-like layer of erect elements, hyaline in KOH, with rounded to subacute apices; some elements with thick walls; pileocystidia up to about 140 x 8 µ, clavate to cylindric, positive in sulphovanillin and with refractive-ochraceous contents in KOH. REFERENCES: Kauffman, 1918. (Bills, 1984; Kibby & Fatto, 1990; Phillips, 1991/2005; Roody, 2003; McNeil, 2006.) Herb. Kuo 07140404, 07250402, 07180709, 07010803, 07210801, 06271303, 07021401.